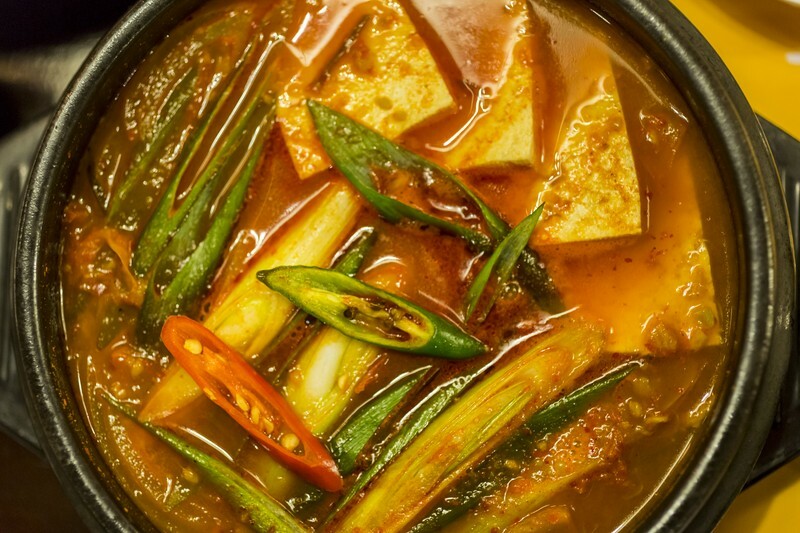 For those of us living in Phu My Hung, traveling outside of “Korea Town” (as this area is informally known) in search of Korean food may seem foolish however, Arirang BBQ (11-13 Lam Son Square) was well worth the cab fare, and the perseverance to find it. The only indication of the restaurant’s existence was a sign near the beer house adjacent to the Caravelle on Lam Son Square which will lead you to another sign by an elevator, the elevator mercifully contains another sign indicating the floor to select. In spite of its devil may care location it was near capacity on a Monday night with families, couples and large groups of friends and salarymen. Ordering was made simpler thanks to the staff who were happy to make recommendations, answer enquiries, and were never without a smile. They informed me the name “Arirang” comes from a tradition Korean folk song considered an unofficial national anthem in both North and South Korea; some may remember both Koreas marched together at the Sydney Olympic Games to this song. 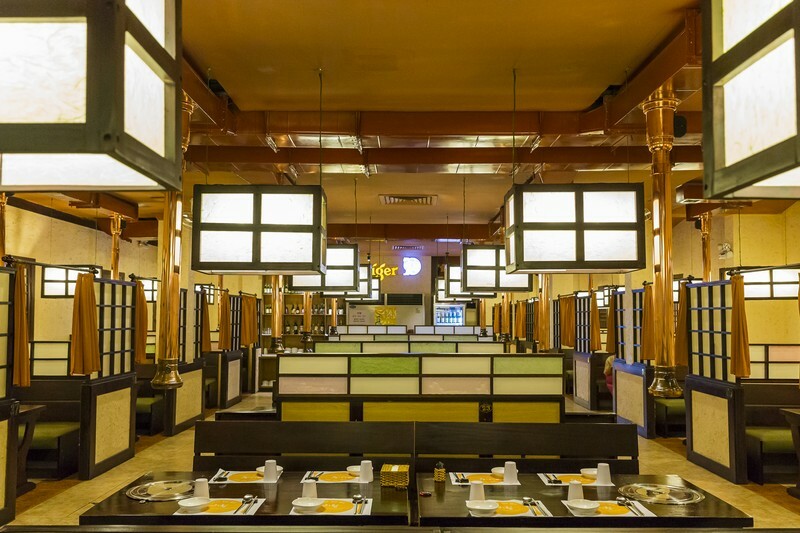 The traditional aspect of Arirang certainly shines through the restaurant’s concept with the waitresses dressed in hanboks, textured bamboo painted walls and booths separated by tall walls of translucent stenciled paper. There was also a room available for the fully traditional style of floor seated dining. When the complimentary banchan (side dishes) arrived, it included, among my favorite mixed cabbage salad with mayonnaise, a variety of kim chi, kkakdugi (which was made with daikon as opposed to the traditional napa cabbage), dopoki (hot and spicy rice cakes), dubu jjiagae (tofu stew), bindaetteok (mung bean pancake) and namul (seasoned, parboiled green spinach). These were set alongside a saucer of mild and flavorful gochujang (a Korean chili paste) and small pile of salt mixed with matcha tea powder which is actually a lot nicer than it sounds. 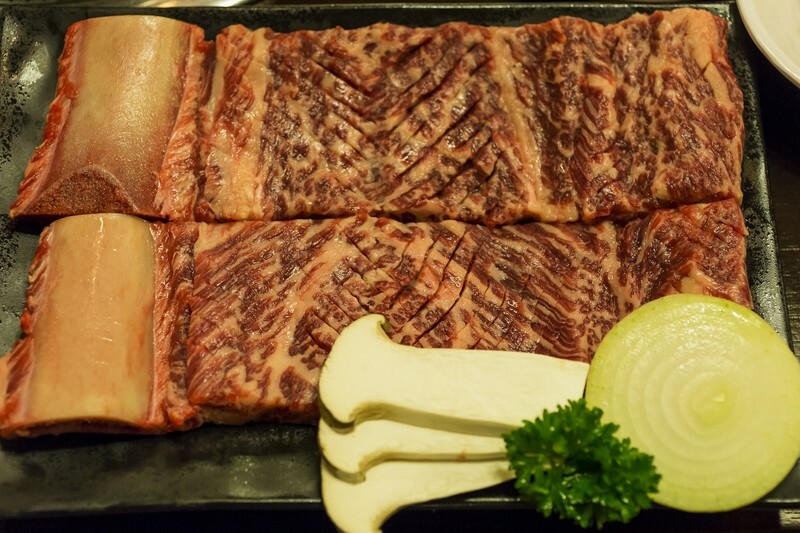 If you’re a first time Korean BBQ diner, a useful tip to know is to not begin eating the banchan when they arrive, wait until the meat is cooked so you can pair them together. 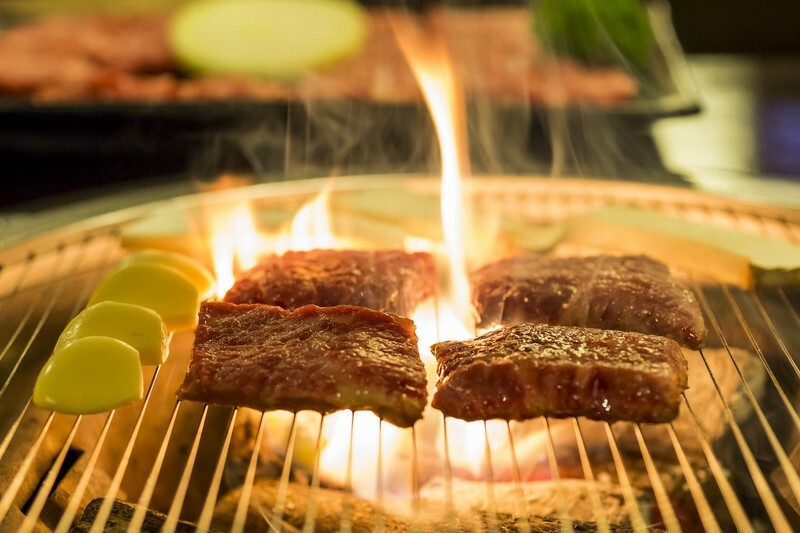 Luckily, the restaurant provided a waitress to tend to barbeque to ensure the meat were grilled to correctly – a real comfort for a Korean food novice such as myself. She also explained how to eat certain meats and what meats best complemented the banchan. For our meats we were recommended kkotsal (VND510,000) and galbisal (VND380,000). 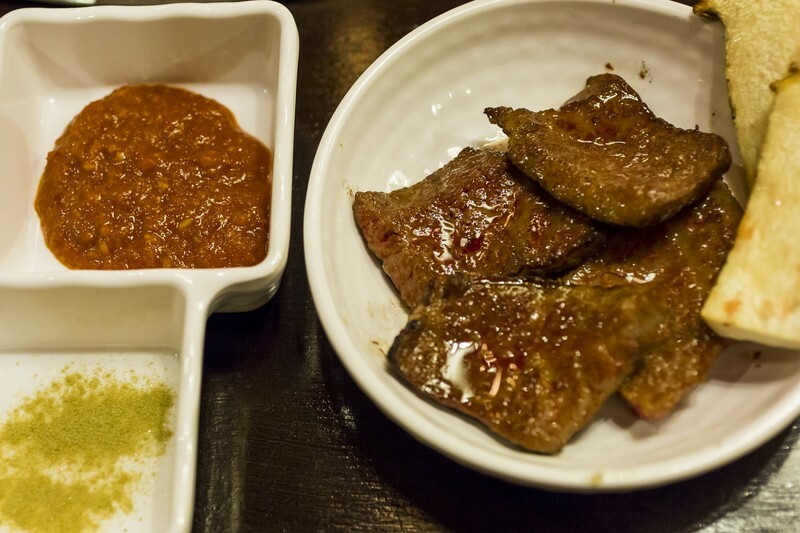 The kkotsal were boneless beef short ribs that were melt-in-your-mouth tender. A little chewier, the galbisal was still great to eat folded in lettuce, dipped in gochujang and sprinkled with matcha tea salt, but I found the meat was better eaten by itself. 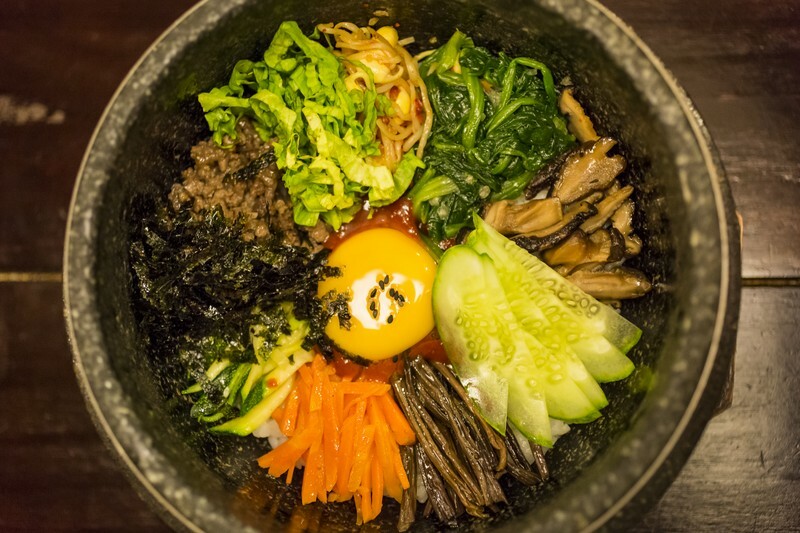 We also ordered a dish I was already familiar with – the mixed rice bibimbap (VND150,000) – which was served in a traditional dolsot hot stone. The flavors blended perfectly and it was even too big for two people to finish. 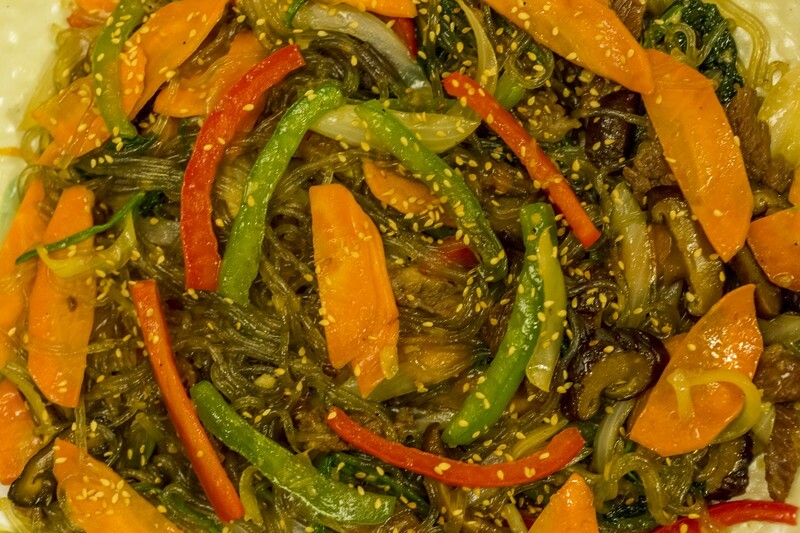 Something that was definitely unexpected was the japchae (VND320,000), a remarkable dish made of translucent sweet potato noodles stir fried in sesame oil with carrots, onion, spinach and mushrooms. If there’s any room left on your table, or in your stomach for that matter, this is definitely worth ordering. To drink we had soju (rice wine), which had been kept at a near freezing temperature for a smoother taste and was served with limes.